Prayer Changed Husband From Cheating On Me. Last week we started with the first part of the testimony of Tesy (South Africa). Tesy did not know that Bob (her husband) was cheating on her until a neighbor (and fellow Church member) hinted her. Later that day when Tesy checked Bob’s things, the signs of the affair was everywhere. The girl’s pictures, gifts and love notes were easy to find. When she confronted Bob, he easily admitted having an affair. There was a fight in their home; Bob walked away next day and moved in with his mistress. He also announced that he was through with the marriage with Tesy. Tesy didn’t want an end to their marriage and turned to God in prayers. During a search at Google, she hit our site. I had some kind of peace and assurance from day one of our prayer. It was like we were physically praying together. Still no answers but we prayed the more and things did not improve. In fact it seemed to get worse. For example, my husband and his mistress moved out of town to God-knows-where. I had to go to his office before they told me he was on vacation. I grieved but Osita said God’s answer was nearer than I thought. That was very hard to believe but I held on to my prayer schedule. I called on God, shouted, wept, slept and woke. I couldn’t think straight; was I going crazy? Osita said we would get answer, I bought a blockbuster prayer e-book with fire prayer points from his site (written by him) and we prayed on. The fellowship was worth much more than the few dollars I bought the book. On October18th, my husband called me for the first time in 18 months, to know how we were faring. I was overjoyed, yet angry. How could he be cheating on me and still asked how we were doing? Then I remembered what is written in the e-book about the returning husband. I told him we missed him and asked when he would be coming home. He told me he missed us and felt like ‘a fish out of water.’ I couldn’t believe I heard him right! When the call ended, I was so happy I could neither eat nor sleep that night. I couldn’t get Osita on phone that day but I shared with my sons and a few close friends. My friends doubted my husband’s sincerity and asked me to tread carefully so that he doesn’t shatter my heart one more time. I got Osita on whatsapp to tell him what happened so far. He advised not to discuss anything of this with my friends until my husband returns home. He brought two more prayer points (thanksgiving points, really). He Stopped Cheating On Me And Came Back Home. Two days later (10.20pm 21/10/2014 precisely), my husband came home with his personal things. Our sons were already asleep when he arrived (he had called me earlier that he was coming home). We woke them up and he was just begging us to forgive him and take him back. I told him I have forgiven him before his return (Osita’s advice). But I couldn’t help staring at him ceaselessly. That night we barely slept as he told me some disturbing dreams that kept coming to him and how he came to the decision to stop cheating on me and leave Meg (that was her name!). It’s a long story. I told Osita all this but he said I had to write in to encourage others. I had to wait till today (29/10/2014) to be sure I’m not dreaming (I’m sorry to say). I give all glory to God who answers prayers and changed my husband from cheating on me; yes, He can change any cheating husband and turn his affection back to his wife. No one should give up on God, no matter what it looks like. Trust Him, follow Him and He will perfect His word in your marriage. Are You Still Praying For Your Husband? What can you get from this testimony? Do you have anything similar, or still struggling with your husband's behavior? Would you like your own story to end on such happy note soon? Share it with us here. Husband Cheating With The Woman In His Office. How Do I Make My Prayer Work For My Husband? Will counseling Work For You? Is Your Husband Too Immoral? Let's Partner With You To Pray Your Husband Out Of Cheating And Lying. Subscribe To the Free E-zine Below And Get Started! I promise to use it only to send you Help Me In Prayer!. 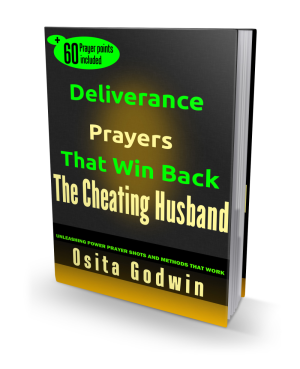 77 Targeted Prayers With Amazing Powers To Change Your Cheating Husband Dramatically. 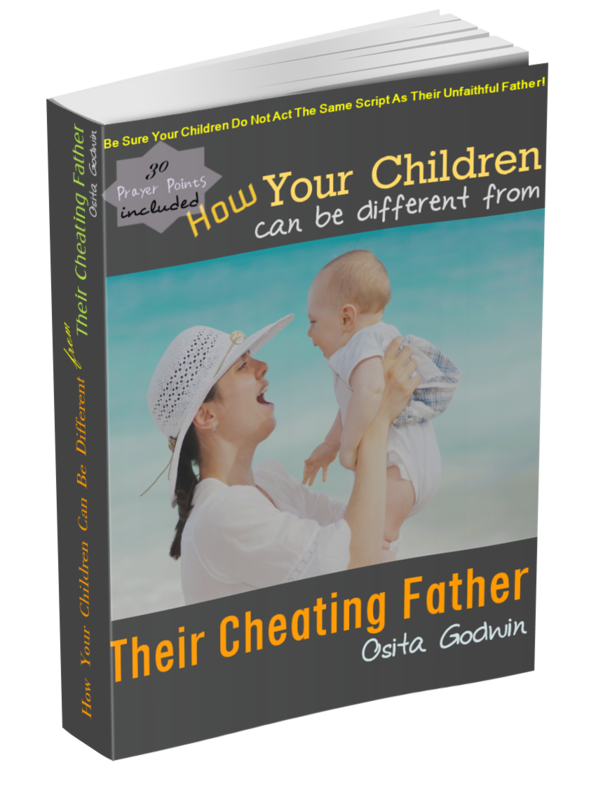 Don't Let Your Children Become Like Their Cheating Father! Focused Prayers For Breaking Generational Curse Of Cheating And Divorce Off Your Children. Information on this site is not intended to influence or lead you in one direction or another. A decision to use, or not to use, this information is the sole responsibility of the reader. Please see an attorney or a qualified counselor for proper assessment and advice on your options.